I want to make this review short because I need to go back playing Into The Breach. FTL was one of the most moreish games I ever had the (mis)fortune to stumble across, and accounts for dozens of afternoons, evenings and nights spent idly jumping between the stars and desperately trying to find a fire beam. Into The Breach has somehow perfected that formula that I didn’t realize wasn’t perfectible in the first place. Into The Breach is a beautifully simple, instantly understandable game. You control three mechs, known as Riftwalkers, that have to battle the monstrous Vek destroying Earth. Just picture Pacific Rim and you have a pretty solid grasp of the story. The maps you fight in are small, comprised of an 8×8 grid in which every monster, mech and mountain take up one space. Inside this grid, despite its simplicity, is a world of variety, puzzle and satisfaction. Almost all your objectives include more than simply killing the Vek, though. You might be ordered to defend a particular structure or prevent a certain amount of damage, which leads to Into The Breach’s best mechanic by far. You can see exactly what the Vek are going to do on their next turn. Their attacks are all completely signposted and leave nothing to the imagination. So your job is to effectively repel these assaults. Attacks have the added ability of knocking enemies back a space, so with a little practice, you can start pushing enemies into their own attack patterns, protecting the objective and doing them so extra damage. This is the genius behind Into The Breach, weaving a turn-based game into a series of micro-puzzles each and every turn. As you start to understand the mechanics more you can start to layer in extra thought to, positioning yourself for the next turn or preventing enemies from spawning. And with the procedural generation of each map, you can keep playing without the puzzles ever feeling too familiar or trite. These maps and the way the Vek choose to attack lead me to a question that is either a testament to the mechanical design or a clever piece of programming. I cannot tell whether the game always has a solution. Some instances have left me facing down an overwhelming attack that initially looked hopeless. But with a little forethought, I would manage to not only find a way to survive but to effectively take control of the map. Sometimes I can’t find any such solution and accept defeat, but I always wondered if the game had left a safe route I failed to notice. Personally, I hope that isn’t the case. I think it’d diminish the satisfaction of completing a tricky level if there was always a way to complete it, but the thought does itch at the back of my mind. These perfect little teasing puzzles would already be enough for Into The Breach, but the game still offers additional variety. Broken into four islands, you’ll encounter new Vek, objectives and environments as you progress. While the first island offers up forests that can be set ablaze and used as traps, later islands include sand, ice and A.C.I.D. 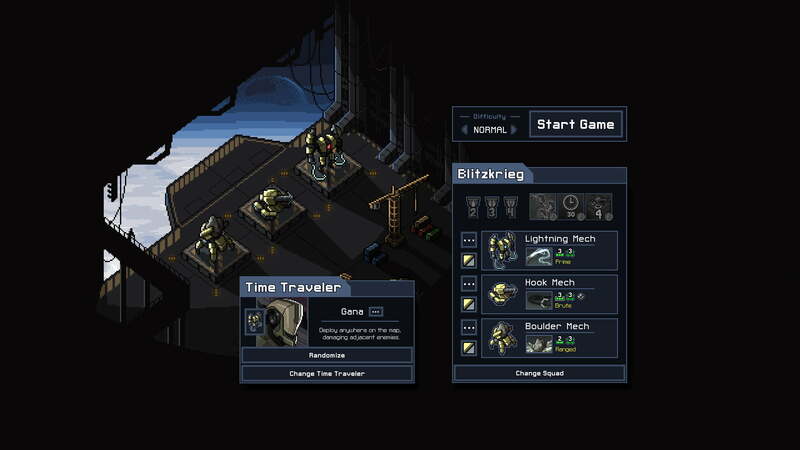 These offer up new dynamics to experiment and take advantage of and Into The Breach continues to surprise even a dozen hours in. What’s more, after you complete an island once, you can tackle them in an order in future games. 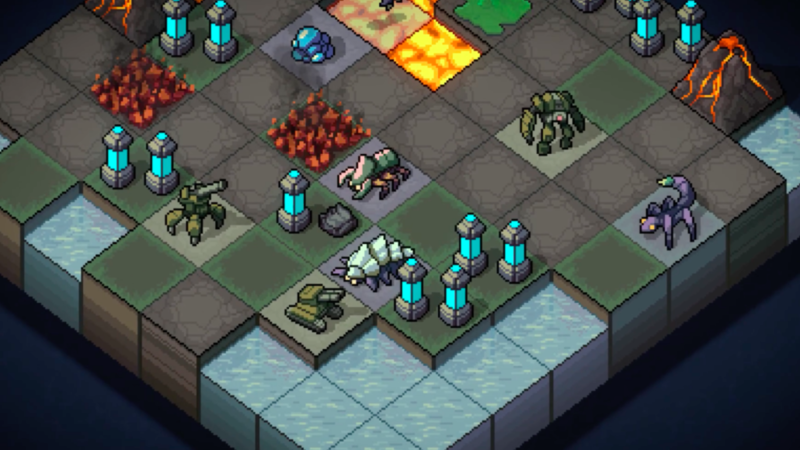 This is because Into The Breach does an interesting play on the permadeath game mechanics. If one attempt fails, you can send a single pilot back in time to try again. Each pilot has a set of bonuses they unlock as they level up, and saving one a couple of times gives you a much better chance of surviving. Naturally, the levels all randomize when you start again, but it’s a nice touch that lets you form a connection to a pilot that’s been through hell with you. There are so many little things that make up Into the Breach and honestly, it’s hard to pick a fault with anything. Overcoming challenges feels really good when they looked impossible to begin with. The learning curve is beautiful in that it lets you go from just barely surviving to completely whole islands unscarred. The graphics are lovely, little pixel sprites that can be read at a glance and just look pretty. When you first drop into a level you’ll see little speech bubbles praising the Riftwalkers and it’s just these little touches that emphasize how good the game is. The soundtrack might not be as iconic as FTL, but it doesn’t harm the experience in any way. That and the occasional confusion over the length of an enemy’s attacks are the only downsides to this incredible game. It even runs perfectly on my clanky old laptop. If you’re looking for a successor to FTL, they have developed the impossible.